When Alford returned Brady’s interception 82 yards for a 21-0 lead, it seemed the Falcons held an insurmountable lead. Did you know when Alford broke out with his 82 yard interception return for a TD, it was the first in Super Bowl history returned for a score by a team that lost the game? The turning point last February was Freeman’s whiff and Donta Hightower’s sack of Ryan. Well a sense of de ja’ vu fell along with the confetti in Houston last February where there was a seismic shift from near Super Bowl champion to one of fallen prestige. This wasn’t an ordinary loss. It was historic and how this team can pick up the pieces and move forward offers the first questions to what they will do in 2017. The Falcons have had several coaching changes as Defensive Coordinator Richard Smith and DLine coach Bryan Cox were let go. New DC Marquand Manuel will inherit the 26th defense in football and will assume play calling duties. Quinn had stripped Smith of play calling duties as the Falcons foundered early in the year. Former 49er great Bryant Young will take over DLine coaching in Cox’s absence. Although Vic Beasley led the NFL with 15 1/2 sacks, as a unit they only compiled 34 as a team. Now you see why the defending NFC Champions traded up to select Takkaris McKinley in the 1st round. You can clearly see Dan Quinn wanting to recreate the Cliff Avril / Chris Clemons twin DE pass rush when his Seahawks became champions back in 2013. If he can develop quickly this team is built to play down hill with a lead. Pin their ears back and get after the quarterback. Can Beasley repeat his 2016 season sack total with offenses geared to stop him in ’17?? However upon further review you can see where the defense needs improvement. The Falcons finished with a ranking of 17th against the run. Not bad until you remember this team had several double digit leads that forced their opponents to take to the air. So going into 2017, opponents will look to run the football and keep Ryan and Julio Jones off the field. Call it good self scouting but the Falcons have to improve on their 25th ranking allowing 4.5 yards per carry as they did last season. No CB can handle Jones 1 on 1. Patrick Peterson found that out the hard way. Offensively the Falcons are built to be a juggernaut and the catalyst is All World wideout Julio Jones. A younger quicker version of Terrell Owens & truly the best receiver in football. After averaging 120 rec. for 1,732 yards over the 2014 & 2015, his numbers fell to 83 catches 1,409 yards and 6 scores. The attention he garnered allowed Mohammad Sanu & Taylor Gabriel to combine for 95 rec. 1,232 yds and 10 scores. The offense blossomed into one of the highest scoring in NFL history with 540 points. Yet when you look at Jones, he is the one the Falcons couldn’t target enough. Just like T.O. in his only Super Bowl appearance,had the Falcons gone to him more in the 2nd half against New England they would have won. His size, speed, hands, and ability to toe tap on his sideline receptions makes him impossible to guard one on one. If the Falcons are to repeat as NFC Champions and make it to Minneapolis, the team psychologists will be the MVP. Make no mistake the demons from Super Bowl LI are being relived in the minds of all the Falcons. It will be imperative to see how this team reacts to 2nd half momentum swings that go against them. We have to see if the team’s fight or flight mechanism has been damaged. From an X’s and O’s standpoint, the Falcons should glide right back to the Super Bowl. The psyche of this team coming back from blowing a 28-3 lead will haunt them in 2017 and they won’t make the playoffs. Go back to all the great upsets and collapses in NFL history and you’ll see the majority of the teams follow with a disappointing season. If you have read my Missing Rings articles you’ll see The Chancellor has chronicled this over the generations. Deion Jones seen here putting the wood to Cam Newton is a force. A Falcon fan or sympathizer will say “yeah…but that happened to those teams”…. and those who don’t learn from history are doomed to repeat it. Remember when Navorro Bowman knocked down Ryan’s 4th down attempt in the 2012 NFC Championship?? What happened?? Well…the 2013 Atlanta Falcons collapsed to 4-12 where they had been 13-3 with homefield throughout the playoffs the season before. No significant injuries and they coaxed TE Tony Gonzalez to not retire and signed RB Steve Jackson. So here we are headed into the 2017 season… where is the psyche of this football team and what will happen this season?? 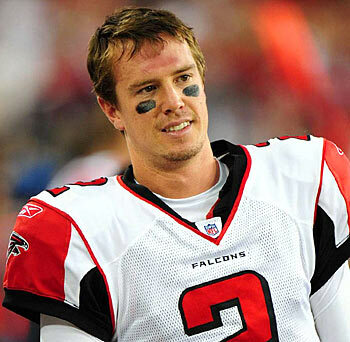 2013 Atlanta Falcons Preview – Did They Let Their Super Bowl Window Close? Julio Jones was on a roll in the first half of the NFC Championship Game. Think back to the second quarter of last year’s NFC Championship Game for a second. 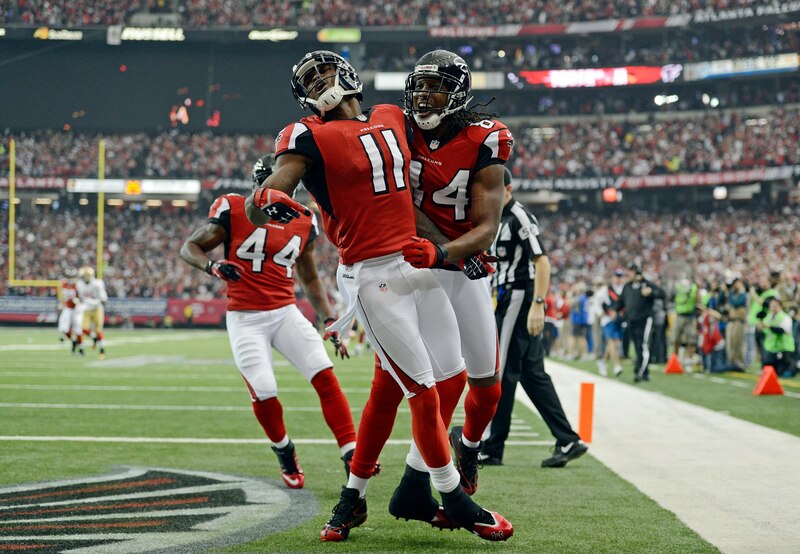 Julio Jones had just caught his second touchdown to put the Atlanta Falcons up 17-0. The crowd was into the game and after the comeback scare the Seattle Seahawks threw at them the week before, there was no way the 49ers were going to comeback. No way. They were just a little over 2 quarters away from Super Bowl XLVII….or so they thought. The 49ers roared back to rob the Falcons of that trip. It looked like the maturation of the 5 year plan of Head Coach Mike Smith had fallen just short. Future Hall of Fame Tight End Tony Gonzalez stood before the media saying goodbye. A great NFL season had come to an abrupt halt. However it looks like the 5 year plan came with a one year option as the Falcons coaxed Gonzalez out of retiring. They replaced a slowing Michael Turner with former St Louis Ram Steven Jackson to increase offensive firepower. Talks are still ongoing with former Giant DE Osi Yumeniora, who lives in Atlanta by the way, to replace the departed John Abraham. Then get this… since the Falcons have lost more free agents then they have signed they have been awarded four additional draft picks for this year. An extra fourth rounder and three seventh rounders for a total of 11 draft picks. Maybe this sixth year won’t be so bad after all. Matt Ryan’s 6th year is where he has to step into the league’s elite in the playoffs. Quarterback: Nowhere else can you look at a quarterback and say the future is now like you have to with Matt Ryan. Once we watched Joe Flacco break through to join the ranks of Super Bowl champion quarterbacks, just winning a playoff game is not enough. Although if you look at the playoff game he won he showed you why some still have question marks about him. In that game he was 24 of 35 for 250 yards 3TDs, but threw 2 interceptions that helped fuel Seattle’s comeback. He disappears in the middle of games and did so in the NFC Championship as well. What leads to the upside is he did march the Falcons to his first playoff win after falling behind with :31 left to play. With a berth in the NFC Championship at stake “Matty Ice” connected on 3 passes and put them in range of the winning field goal to escape 30-28. He led the Falcons on 6 last second winning drives like that in the regular season, so he is cool under fire. For the season, his stats were spectacular completing 68.6% of his passes for a team record 4,719 yards and 32 touchdowns. Owner Arthur Blank succeeded in drafting a QB to be the face of the franchise after the Michael Vick era. However Ryan sat in that tier of “yeah-but” quarterbacks with Joe Flacco, Matthew Stafford, Jay Cutler, and Tony Romo as regular season statistical guys that hadn’t shown up in the post-season. Now that he’s in his prime and Flacco broke through that wall, he has to do so as well. He has to keep his intensity for the entire game and not wait until the last minute. At quarterback the Falcons are Super Bowl quality. Jackson should be deadly in this offense. 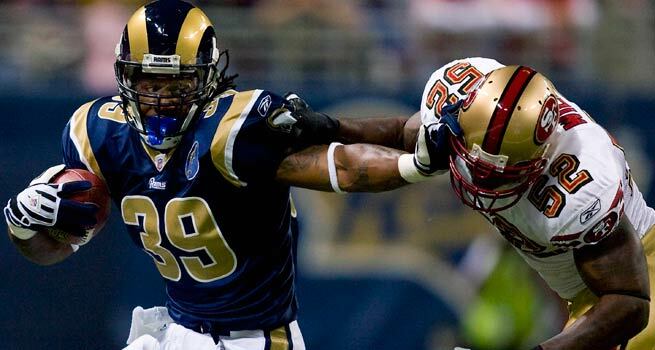 Offensive Backfield: The signing of former St Louis Ram running back Steven Jackson could be the move to put Atlanta over the top. Face it Michael Turner in recent years declined from being a good running back to a marginal ball carrier. He could only get the yardage the offensive line produced and nothing more. Evidence?? How about 3.6 yards per carry for the season?? Enter Steven Jackson. There was an overall feeling in previous years, throughout the league, that the Falcons weren’t a tough team. Jackson with his bruising style should change that completely. Although the Rams went to a passing offense he still made it to 1,042 yards in just 257 carries. In 7 of the last 8 seasons he has averaged 4.1 yards per carry or greater. That’s as the focal point of the offense. Now he gets to line up with Julio Jones, Roddy White, and Tony Gonalez as passing targets to free the running lanes?? Yikes!! He hasn’t had anywhere near that much talent around him before…trust us Danny Amendola doesn’t scare defensive co-ordinators. He should have a 1,400 yard season now that he has a chance at a Super Bowl ring. That hunger should feed the team’s urgency as well. Jacquizz Rodgers is the 3rd down / change of pace back who has some burst. Only going into his 3rd year he’s learning the game and is adept at slipping out and catching passes for 1st downs. They’re going to be playoff quality at least with Jason Snelling backing up Jackson as well. One more year for the future Hall of Famer. Receivers: Just when NFC South defensive co-ordinators thought they could take a break, Atlanta drafts Julio Jones. 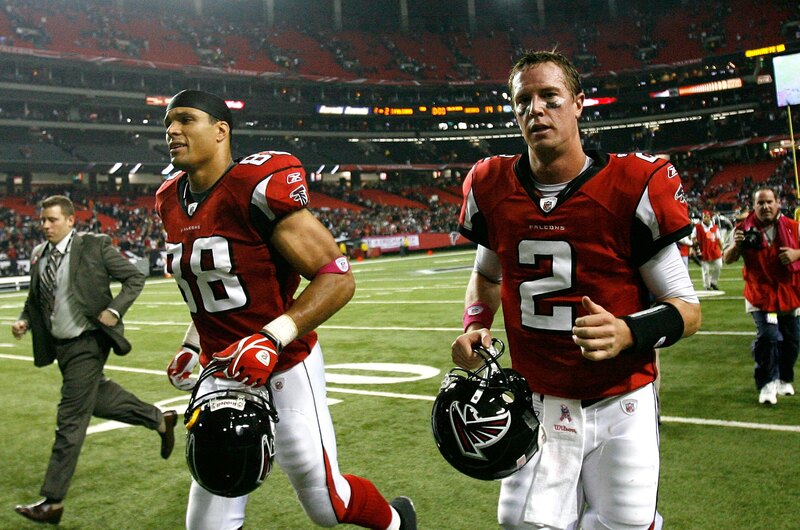 Now they bring back Tony Gonzalez for another go ’round. By the way you do realize in 2010 Roddy White led the NFL with 115 receptions while being second in yards with 1389 yards right? That was 3 years ago?? Well last year White caught 92 passes for 1,351 yards and 7 touchdowns and may not be the best receiver on the team anymore. Julio Jones replaced him on the NFC Pro Bowl roster after a 79 catch 1,198 yard season where he scored 10 touchdowns. This is firepower!! Jones is only going into his 3rd season and benefits from the coverage afforded White and Gonzalez. Defenses can pick their poison because they are going to lose. Which brings us to the slowing, aging veteran tight end in Tony Gonzalez. Wait a minute, what aging process?? He caught 93 passes for 930 yards and 8 touchdowns. He was voted All Pro and made the Pro Bowl. In all actuality, this may be the greatest group of traditional receivers (2WR / 1TE) in NFL history. It certainly is when it comes to production. These guys had 264 rec. for 3,479 yards and 25 touchdowns. Compare this with the 1980 San Diego Chargers who had John Jefferson, Charlie Joiner, and Kellen Winslow when they had 242 receptions for 3,762 yards and 26 touchdowns. It’s certainly worth debating and for one more year this team is Super Bowl quality at the receiver position. Offensive Line: One loss for Atlanta is the retirement of 14 year Center Todd McClure. However the line needs some improvement as evidenced by their fall to 29th in rushing with just over 1,300 yards. In contrast with the same cast of characters they were 12th in 2010 with almost 1900 yards. Look for a draft pick to be used to fortify the offensive line, whether a Center is drafted or a guard is picked. One will switch over to snap the football. They only allowed 28 sacks as a unit but frequently couldn’t push the pile on 3rd and 1 to keep drives going. Did you know that on 3rd or 4th and 1 including goal line, this group could only power for the first down or touchdown on 50% of rushing plays up the middle or to the strong side?? How much of that falls on the line and how much falls on the running backs?? Well since every running back ran for less than 4.0 yards per carry and the short yard percentages were 25th and 24th respectively, this group gets the blame. When it’s 3rd and 1, you don’t need Eric Dickerson to get that yard. It’s a matter of attitude and toughness at that point and this team needs to get tougher on the point when they run. Since they did get Matt Ryan hit 80 times passing the football this team gets an average grade on the offensive line. We have to see how they develop. Defensive Line: Although there is speculation this team still hasn’t signed Osi Yumeniora or the replacement for John Abraham yet. You have to understand they needed help to rush the passer anyway. Did you know that John Abraham not only didn’t record a sack in last year’s two playoff games, he didn’t produce 1 tackle?? You have to go back to the two losses to the Giants and Packers in 2011 and 2010 to find some postseason pass rush from him. Just one sack in each of those which turned out to be losses. Kroy Bierman (4 1/2 sacks) Jonathon Babineaux (3 1/2 sacks) and Vance Wlker (3 sacks) are the returning linemen. Just 10 sacks between them. The Falcons were 24th overall and 21st against the run and this group has to take the brunt of that as well. The Falcons will need to draft some help and possibly sign two key free agents here. After watching this group get tortured trying to chase Russell Wilson who threw for a postseason rookie record of 385 yards against them, you see why Falcon’s Brass is making the change. That should have favored a John Abraham and it didn’t. This could be the group that sinks the Super Bowl aspirations of this team and is below average. Weatherspoon is a fast heady player who should continue to get better. Linebackers: This is a speedy group that often gets linemen out on them when the team is run on. 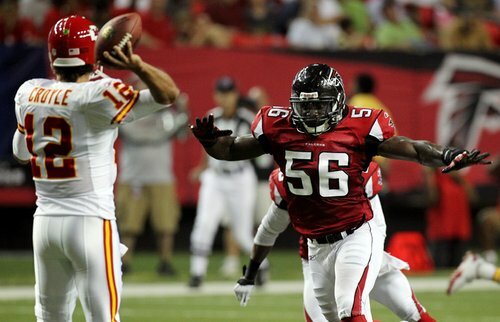 They have to shed blocks better and Sean Weatherspoon should have a breakout year going into his fourth season. Last year he tied Stephan Nicholas with 95 tackles for the team lead while compiling 3 sacks, an interception and a forced fumble.This is with him missing 3 games last year. Nicholas also garnered 2 sacks and an interception in his 6th season. Right now they are as good as it gets in the NFC South. These two are on the field for nearly every play including the Spread and Pistol formations. They just need to make a few more splash plays and force more turnovers to improve the defense from a statistical and tactical standpoint. With a little improvement this will be a playoff quality group. 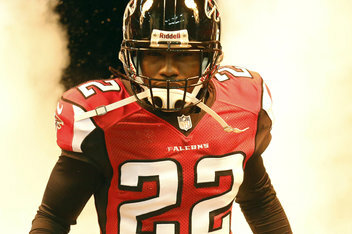 Secondary: Last year the Falcons acquired Asante Samuel to help with the nickle slot receivers and insurance if they lost Brent Grimes or Dunta Robinson. Turns out Grimes went down with an injury and all Samuel did was intercept 5 passes returning them for 110 yards and 1 touchdown. What was amazing is the Falcons only had 7 total interceptions from their cornerbacks. Now Grimes and Robinson are elsewhere and Samuel is entrenched as a starter. Opposite him could be Robert McClain but he’s more of a journeyman than a starting cornerback. Look for the Falcons to make a move for a veteran here with a late summer pick up more than a draft choice since they’re trying to win now. Samuel is the NFL’s all time post season interceptor, yardage, and touchdown leader. The Falcons are better at safety where Thomas DeCoud (76 tackles / 6 ints) and William Moore (76 tackles / 4 ints) had a nose for the football. Each will support the run and tackle well in space. Since the Falcons have to manufacture a pass rush they’ll blitz their safeties as well. Both DeCoud and Moore recorded sacks last year. One of the reasons the Falcons were exposed in the secondary was the weak pass rush that left them in coverage too long. If they can shore that up this would be a playoff quality group, right now we have to leave their ranking as average. They host RG III and the Redskins, Patriots, and Seattle again with the winner of that game possibly getting the homefield advantage. After that there are two away games that present problems. One trip to San Francisco and one to Green Bay, if the running game is intact each of those are very winnable. The Chancellor sees the Falcons with an 11-5 or a 12-4 record. They won’t go 13-3 again. It’s all lined up for them if they get the breaks and shore up their defensive front. Time will tell if Matt Ryan is going to make them a Super Bowl team. Second year wideout Julio Jones skies over a Ravens defensive back for a touchdown in last week’s preseason opener. As the 2012 regular season beckons, many pundits and fans are looking for the Carolina Panthers to light up this division. There will be several young stars that will come to the fore in the toughest division in football, yet there will be one second year player who should take the league by storm. Oh you thought we meant Cam Newton?? He’ll do well but the player who is about to break out is WR Julio Jones of the Atlanta Falcons. His play so far in the preseason along with the maturation he showed toward the end of last year. Look out his star is on the rise. However there are several questions moving into 2012. How will the Saints fare with the suspension of Head Coach Sean Peyton?? Will their game day adjustments suffer or will the overall gameplan be inferior?? Have the Panthers made enough moves to allow Cam Newton to star again or will he have a sophomore slump?? Which team was the real Tampa Bay Buccaneers?? Was it the 10-6 2010 team that was coming on at the end of that season or last year’s 4-11 debacle that got Head Coach Raheem Morris fired?? They have a murderous schedule and will lose tie breaker advantages during the weeks of 12-15 where they face San Francisco, who beat them in last year’s playoffs. Then they face a stronger Atlanta Falcons team on the road, then travel to play the World Champion Giants in the cold, then come home to face a resurgent Tampa Bay Buccaneers team. Even though Tampa had a down year in 2011, they only lost 27-16 in New Orleans and defeated the Saints in the Superdome in 2010. At full strength with Coach Peyton, Jonathon Vilma on defense, the Saints would be in good shape against these ball clubs but with a coaching staff trying to keep the ship steady?? These are four losses waiting to happen and all to NFC teams. This is after they would have played the Packers at Lambeau in week 4, and the Philadelphia Eagle in week 9. Too many in conference losses will doom the Saints this year. Super Cam Newton of the Carolina Panthers. Has there been a more electrifying rookie quarterback in NFL history than Cam Newton?? The Chancellor can only think of one and that was Dan Marino’s 1983 season. Yet a closer look and Newton broke the rookie record in week 1 with 422 yards against the Cardinals, rushed for 706 yards and 14 TDs (another record), while completing 60% of his passes for 4,021 yards (another record) and 21TDs. All as a rookie?? Yikes! That dwarfs Marino’s 20TD passes and didn’t start for Shula’s Dolphins until week 6 and was no threat with only 45 yards rushing. What is he going to do for an encore?? Once upon a time Tim Tebow was given the nod over Newton at the University of Florida. My how the tables have turned as the Panthers defeated Tebow and the Jets 17-12 last night in pre-season action. The question is did they do enough to move up in the competitive NFC South?? They still have the “Cash & Carry” backfield of DeAngelo Williams and Jonathon Stewart, who just signed an extension last week. Ageless Steve Smith revitalized his career with Newton’s emergence and may have a running partner in WR Louis Murphy who scored in last night’s game. On offense the answer is yes, but on defense they haven’t done enough. They did get LB Thomas Davis back but they have to keep their fingers crossed he doesn’t injure his knee for a fourth time. They need all the help they can get on a defense that was 28th last year and finished 25th against the run. In this division that last stat will be what they need to improve and the draft only brought one lineman in 4th rounder Frank Alexander. New leaders have to emerge for the Panthers to make a move up… that can happen in 2013. The problem is it’s still 2012 so they’ll improve just a few wins on offense as a team. Former Boise St running back Doug Martin should rush for 1,200 yards for Tampa this season. Now a team that will be the surprise winner in this division is the Tampa Bay Buccaneers. Last year this team dropped to 30th in the NFL in rushing and brought unnecessary heat on QB Josh Freeman. Team brass addressed that with 1st round selection RB Doug Martin out of Boise St. With the rushing attack under performing it also kept the Buccaneers defense from resting. In 2011 this was a run first, pass second team that went 10-6. Josh Freeman had the second lowest touchdown to interception ratio, 25TDs to just 6 interceptions, to a record setting Tom Brady. With the acquisition of WR Vincent Jackson from the San Diego Chargers to go along with TE Kellen Winslow Jr, WR Mike Williams and WR Arrelios Benn, this team has some big targets. Speaking of Tom Brady, the Buccaneer defense made his life miserable in pre-season action Friday night. The Bucs pass rush harassed him all night and made him throw a pick six in a 30-28 win. Brady played into the 3rd quarter (unheard of in pre-season) and New England needed 2 4th quarter touchdowns to make the score close. One of the differences was the efficient play of Freeman and Doug Martin, who rushed for 53 yards on 13 carries and sat out more than half the game. 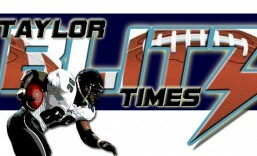 This talent who has been a Taylor Blitz Time favorite https://taylorblitztimes.com/2011/08/02/2011-heisman-campaign-doug-martin-of-boise-st/ will tilt the balance of power for them from a tactical standpoint all year. They should return to form and match the 10-6 record of 2010. They’ll be ready to make a serious move in 2013. However 2012 will belong to the Atlanta Falcons. They have built for this season for the last four and this is the year for the payoff. TE Tony Gonzalez can’t go forever and RB Michael Turner is about to turn 30. When the Falcons lost in last year’s wildcard to the New York Giants, it marked the second season in a row their season ended at the hands of the eventual Super Bowl champions. As a matter of fact, if you include the 2009 NFC Divisional playoff loss to the Arizona Cardinals, 3 of the last 4 seasons has ended at the hands of the eventual NFC Champion. Its time for their maturation and ascend to a Super Bowl themselves. Head Coach Mike Smith and Matt Ryan have to prove they can win a playoff game. They are primed as a team talent wise to make a move.